Lovingly crafted with Carmine Jewel sour cherries and carefully blended with a hint of Cabernet Sauvignon, Prairie Cherry wine is full-bodied, with complex flavour and aroma, gentle tannins and an intense burgundy colour. Prairie Cherry wine is best served at room temperature with pork, wild meat, or in a fruity sangria mix, and once opened, kept refrigerated and consumed within a few days. Originating in the Burgundy region of France, Pinot Noir grapes are known for it’s cherry/blackberry flavours. 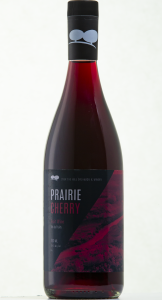 We carefully blended our Prairie Cherries to create a unique Pinot Noir with notes of cherry and raspberry. This light wine is very versatile as it can be paired with most main courses. Our Pinot Noir wine should be served at just under room temperature, and once opened, kept refrigerated and consumed within a few days. Originating in the Burgundy region of France, Chardonnay grapes are known for it’s tropical/citrus flavours if grown in warmer climates. We carefully blended peaches, to create a unique wine with notes of peach and tangerine, and can be paired with poultry, pork loin, seafood, and mild goat cheese. Our Chardonnay wine should be served chilled, and once opened, kept refrigerated and consumed within a few days.